These words seldom signal good news, but coming from my stoic husband in his home office upstairs, I knew something was seriously wrong. “What happened?” I called up to him. “I just got this about Puffin M,” he said, coming downstairs to share his distress. Puffin M was missing and presumed dead. Now we were both upset. I had never met Puffin M, yet I felt I knew him. My husband had “adopted” him for me as a birthday present in 2013. For the past two years, I had received a photo of the handsome little black and white fellow with the distinctive clownish red and yellow beak, along with his biography and a detailed summary of his activities on Eastern Egg Rock, Maine. A number of savvy conservation organizations, animal rehabilitators, and zoos use animal “adoptions” like this to raise money to support their worthy causes. We also sponsor a 23-year-old female Atlantic right whale named Calvin through New England Aquarium. You can “adopt” a snow leopard through the Snow Leopard Trust; an orphaned orangutan through Orangutan Foundation International; a shark through Shark Angels; and just about any other creature you can imagine. Just Google “adopt a . . .” and fill in the blank. 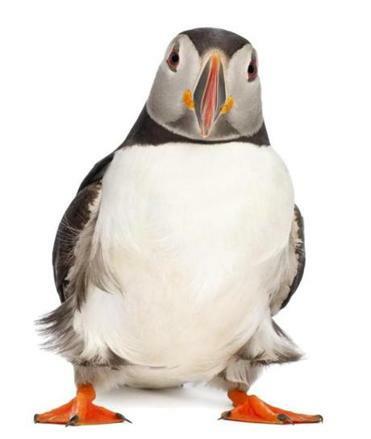 For me, adopting a puffin was the perfect present. I’ve been a puffin proponent ever since I first learned about Project Puffin’s efforts to restore the birds to their historic nesting islands in the Gulf of Maine. Back in 1973, only two nesting colonies in Maine survived; the rest had been killed a century before. But that year, ornithologist Steve Kress came up with the maverick idea to transplant baby puffins (adorably called pufflings) from Canada to Eastern Egg Rock off Maine in hopes that, years later, they would return to nest there. Enticed by decoys and audio recordings, the first four pairs returned to nest in 1981; now a thousand puffins raise their young on five Maine islands. I’d tried to get out to see the puffins, but was foiled by bad weather. But now, thanks to Puffin M, at last I had my very “own” puffin to follow — even if I couldn’t visit him. Because of the long-term research on Eastern Egg Rock, I knew more about Puffin M’s genealogy than my own grandparents’. M’s parents, Y54, and MR314, had one of those May-September romances: Y54 was 23 years old, MR314, only 6. But it was a successful pairing: when Puffin M hatched on June 20, 2000 in Burrow Number Three on the south end of the island, he became what would be the eldest of nine pufflings his parents raised over the course of their eight years together. “Researchers first spotted M on June 3 at the O Burrow entrance in the Big Boulder Jumble area on Egg Rock,” I learned. On July 4, an unbanded female, M’s mate, was seen delivering food to the burrow where the couple was raising their single puffling. Why do details like this so delight us? Why is it more fun to adopt a particular, named animal than to make a donation for conservation of a species? Because, as researchers confirm, no matter the species studied — be it puffins or snow leopards or even sharks — animals are individuals, just like we are. And their stories can be as compelling as our own. It’s through stories about individuals that we make lasting connections. Ideas interest us; individuals move us. It’s hard to imagine saving a whole species. But helping one individual? That’s something anyone can do. Puffin M’s disappearance was surely even more upsetting news to the researchers at Project Puffin than it was to my husband and me. They‘d known him since he hatched. He mattered to them, not only as a precious and unique individual, but as a member of a colony that staged a hard-won comeback. And it was a comeback now facing new threats: Besides invasive plants and human disturbance, global climate change can profoundly affect the abundance of tiny herring and hake that pufflings need to survive. So along with the bad news in the letter came a plea, signed by Stephen Kress himself: “We hope you will continue to support our efforts by letting us assign a new puffin,” he wrote. You bet we will — and for me, that’ll guarantee another very happy birthday. Sy Montgomery’s most recent book is “The Soul of an Octopus: A Surprising Exploration Into the Wonder of Consciousness.” Send animal questions to Montgomery and co-columnist Elizabeth Marshall Thomas at syandlizletters@gmail.com.